Download the Colossus driver (click the Download button above). Reboot your PC to enable the new Colossus driver. Activation for this version of WinTV v8 is done with your WinTV v7 CD-ROM. A valid WinTV v7 application CD-ROM will be needed to install this WinTV v8 version. If you do not have your original WinTV CD-ROM but would like to update to WinTV v8, you can purchase a new WinTV v8 CD on the Hauppauge webstore for $9.95. This can then be used to activate WinTV v8. If you have a WinTV v7.2 CD-ROM with Extend, the latest version of WinTV v8 with Extend will also be installed. The Colossus support for Windows Media Center allows you to use the Colossus to watch, pause and record high definition TV under Windows 7 Media Center from a cable TV or satellite set top box. It operates in a similar way as other Hauppauge TV tuners for Windows Media Center, but Colossus records in high definition using H.264 encoding. Click here for the installation and release notes. Click here to download the complete installation package. Click here see a picture of the Media Center remote control setup. What Operating Systems are supported by Colossus? Microsoft Windows 8,7 (32 or 64-bit), Windows Vista or Windows XP with Service Pack 2 or later. Do I need a PC to use Colossus? Yes, a PC is required to use Colossus. Colossus is an internal full height PCI Express board which will work in x1 slots. The PC is used to both run the Colossus application plus is the place where Colossus recordings are stored. Can I record video from a composite video source? 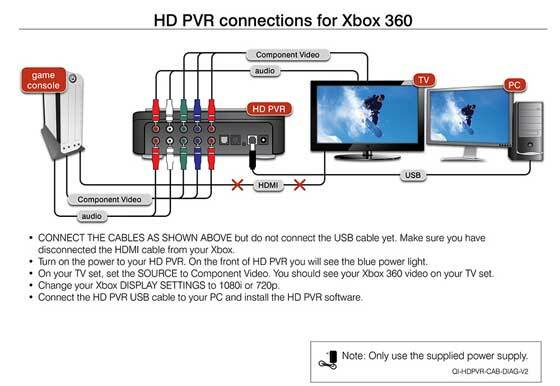 Though the Colossus does not have a dedicated composite video connector, just connect your composite video cable to the blue cable on the Colossus A/V cable set. Recordings will be done from the composite video source. Can I use Colossus with a Mac? There is currently no support for Colossus on a Mac. When you playback an Colossus recording on your PC screen, you need a fast CPU and at least 256MB of graphics memory. Can I use the Colossus with Microsoft's Windows Media Center application? Can I use the Colossus with Linux? At this time, there is no Linux support for Colossus. Yes. By connecting the Component video output from your high definition cable TV or satellite TV set top box to the component video inputs of the Colossus, you will be able to record the TV programs coming from your set top box to the hard disk. Component video connections are normally the Red/Green/Blue connectors on the back of a set top box. Sometimes they are also called YPrPb or YCrCb connectors. What type of recordings can I make with the Colossus? Colossus encodes in real time directly to the hard disk in an H.264 format with AC-3 audio. All recording file types can be used to burn AVCHD Blu-ray compatible disk recordings. The Colossus files can also be burned onto a standard DVD+R or DVD+RW disk for playback in a Blu-ray disk player using the included Arcsoft application. What type of audio encoding is made with the Colossus? There are three ways of bringing audio into Colossus: through the stereo audio jacks on the A/V adapter cable, through the HDMI connector or through the optical audio connector on the back panel. When bringing audio in through the stereo jacks, audio is digitized and then recorded as AC-3. When bringing audio in through the HDMI connector or the SPDIF optical audio jack, the audio is recorded in the format which is received. If the source provides AC-3 audio, the audio track is AC-3. If the source provides AAC audio, AAC audio is recorded. There is no conversion of the audio format. AC-3 5.1 channel audio is preserved if you are creating an AVCHD DVD. If you are creating a standard DVD the audio will be transcoded to AC-3 2 channel. Creating MP4 files will also result in 2 channel audio. Can I output files I’ve recorded with my Colossus or other content from my PC back to an external TV monitor through the component video outputs on the Colossus? No, the Colossus does not have the ability to play back recorded videos to an external monitor. The component video outputs act as a pass through for live video streaming from your video source through the Colossus back to your TV monitor. 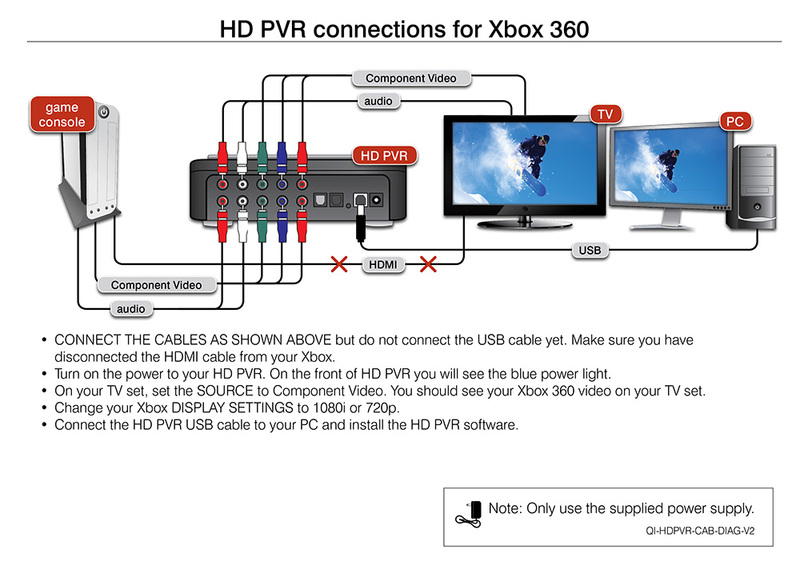 Your PC must be turned on and Colossus must be running in order to pass the video through to the external TV. How can I use my remote control with the Colossus? The included remote control is used with the WinTV v7 application. It is not used with the ShowBiz software for Colossus. Can my PC go into hibernate or sleep mode when using Colossus? When opening the Arcsoft capture module I only see a Channel button? If you have a TV tuner card installed the ArcSoft Capture Module may attach to this or any other capture device installed. If you see a Channel button on the Capture Module window go to the Source drop down menu at the top and select the Hauppauge Colossus Capture Device. In order for the audio pass through to operate correctly you need to configure the settings in the ShowBiz application. To do this follow the installation guide to install the Colossus drivers and the ArcSoft ShowBiz software. When finished power on the Colossus and open the ShowBiz software and click on the “record video” Icon, this will open the Capture module. Choose the audio input from the drop down menu ( RCA, SPDIF), once configured the Colossus will retain these settings. Note: the Colossus must be powered on for the pass through to operate. What resolutions and bit rates are supported using Colossus? What file formats are created by recording with the Colossus? The default formats you can record in are: .TS (transport stream for AVCHD), .M2TS (for PS3), and .MP4 (for XBOX 360). Where can I record the files to using the Colossus and can I use it independently? The Colossus requires a PC (see minimum system requirements under product specifications) to operate. You may then record to any of the hard disk drives installed or connected to the PC, including external drives. Can I burn a Blu-ray disk with my Colossus? No, you cannot burn a Blu-ray disk. However, you can burn a standard DVD that will be Blu-ray compatible (when making AVCHD recordings), and play on a Blu-ray DVD player. I get a black screen in the Showbiz capture module and no output to my TV when I connect my Xbox 360, PS3 to the Colossus. Yes. In the Arcsoft Showbiz application, once you have your completed video file (from the edit section) ready for upload, simply go to the ‘Produce’ section and choose “Upload to Youtube”. The software will automatically create the .MP4 file compatible for Youtube content and prompt you a screen to access your Youtube account, ready for upload. Can I see a video clip recorded from Colossus? If you have an H.264 decoder on your PC or Mac, here is a little video clip (15 seconds) which shows a recording made from a cable TV box through the component video connections. It was recorded using the Arcsoft ShowBiz application at 8Mbit/sec. If you are a developer, you can bring H.264 encoded video in from either Colossus or HD PVR into VLC so it can be streamed out from your PC. Microsoft provides a sample network transmit/receive filter set in their DirectX SDK. Sony Vegas does not detect non-AC-3 audio in .TS or .M2TS files. When recording videos in the Arcsoft Capture module, make sure AC-3 is selected under Format settings. If using Colossus with Sony Vegas, you must use either optical audio (Dolby Digital AC3 audio format) or you must record in MP4 format with AC-3 audio. If you are using a PS3 and want to record TS files for use in Vegas, you must use Component Video and optical audio. 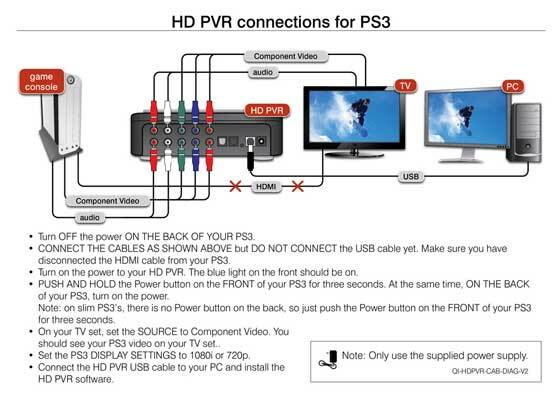 To set your PS3 to optical audio out, in your PS3 go to Settings / Sound settings / Audio output settings. Select Optical digital and Dolby Digital 5.1 Then use an optical audio cable for recording. In Showbiz you have to set the default resolution used when uploading. This is done by going to Options; Preferences; Other and selecting the desired YouTube resolution.